My name is Cheeto, named after the famous orange cheese puff! �%A0My mom, Frita, was left at the city pound only a few days after she gave birth to me and my four siblings. �%A0Thankfully, a foster home was found where we could be safe and well-cared for in a home environment. �%A0We are now old enough to find homes of our own! �%A0I am considered the outgoing one, always wanting to greet visitors and asking to be picked up or cuddled. �%A0I have a lot of energy and am often the instigator of play-time with my siblings. 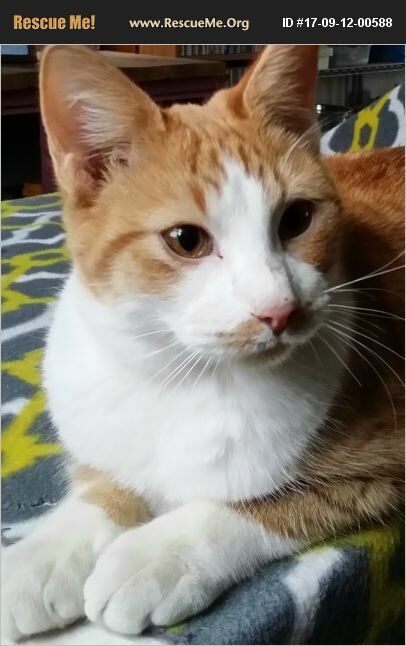 �%A0I would love to find a home in which I am not left alone for long periods of time, or in which I have a playmate to keep me company, such as another cat or friendly dog. �%A0Nothing would make me happier, though, than being adopted with my mom or one of my siblings!